vitamin B solution for at least two hours. Backfill the hole with a well-turned mixture of 50% soil conditioner, 50% present soil. 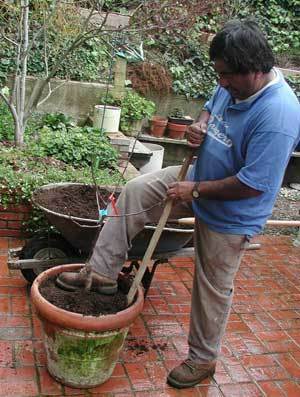 ​​Pack the final layer of soil firmly back into the hole or container with no air pockets around the roots. 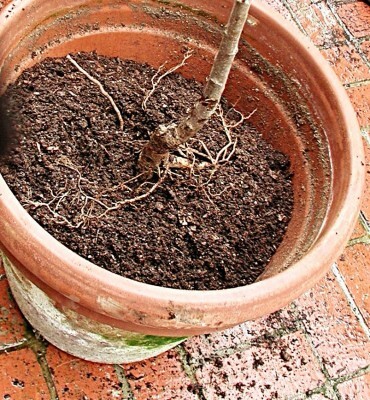 For stronger, faster growth cut back your newly planted trees 1/3 to 1/2. ​​Removing the terminal bud (the dominant bud or primary growing point at the tip of the stem) causes the plant to foliate more quickly across the entire branch, not just the terminal end. When pruning keep in mind what kind of shape you want your tree to grow into and let that guide which branches you're cutting and where. 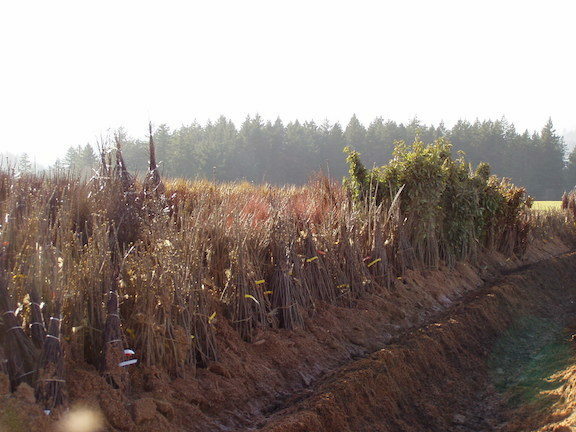 For temperate climate areas the time to prune is December through February. 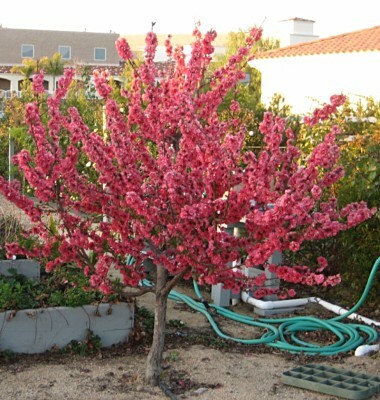 In cold climate areas you can begin to prune at the end of Winter through the first part of Spring. Wherever you are pruning, be sure to do so before the buds start to swell and break. 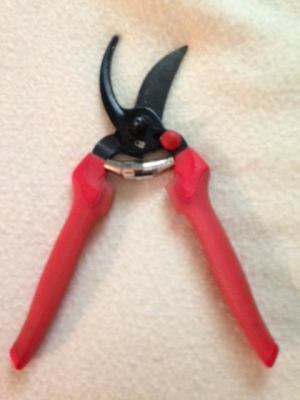 In our opinion, never use anvil type pruners. Yes, they cut but often they also crush the stems and branches. 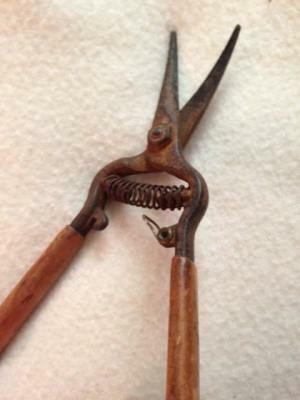 Bypass or Scissor pruners are preferred. The bigger the blade, the easier and cleaner they will cut, especially larger branches. Quality Loppers are a must for any gardener. Unlike smaller hand pruners which often get lost, loppers will be with you forever. You can cut much larger branches with the ratchet type, and much easier. Since Loppers have long handles you can more easily reach inaccessible plant locations as well as prune larger branches more cleanly. Bonsai Pruners are a very handy tool. They have longer needle nose blades making it much easier to deadhead spent blooms (ensuring increased blooms) and prune out small twigs within dense branching. We prefer Bonsai Pruners with a slight curve at the end of the blade. Overwatering - and not cutting plants back by 1/3 - is the primary cause of newly planted bare root plants not leafing out and bearing fruit. When a deciduous tree is without foliage (leaves) it needs little to no watering since it is dormant (or asleep, like hibernation). During this time, there is no Photosynthesis or Transpiration occurring and excessive watering will sour the soil, rot the roots and debilitate the physiology of the plant. Newly planted bare root trees should only be watered when the soil around the plants roots becomes almost dry. Given that bare root fruit is planted in Winter, when it is cold and usually rainy, it's possible your deciduous plant may not need watering until early to mid-Spring. Remember, rain counts as a watering. Once a newly planted bare root plant has foliage, water it more frequently. Generally watering every five to seven days is adequate. If you are unsure if the tree needs water, check the soil's moisture level six to eight inches below the ground. In areas that experience dry and warm Winter / Spring water every three days. Continue to water every three to four days throughout the trees first Summer OR every other day in dry, hot Summer areas. 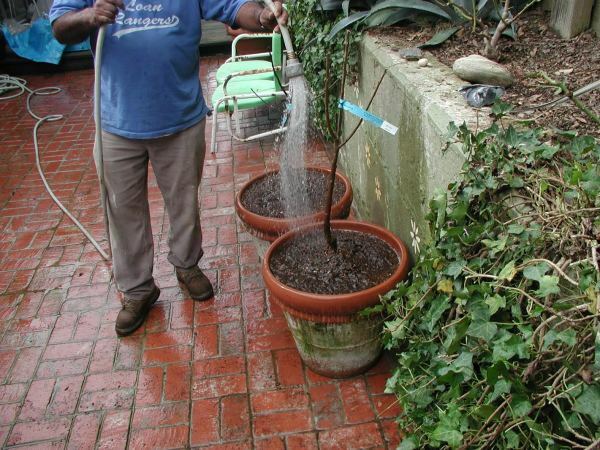 Established fruit trees might not require watering more than every month. 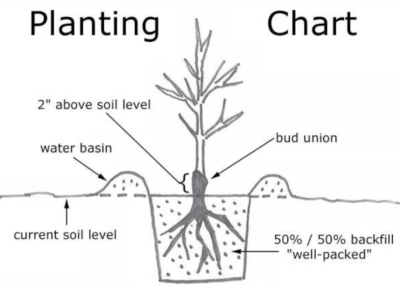 Again, check the moisture level below the soil. In areas where Spring is cool and there is some rain you might not need to water until May, especially for Cherries and Apricots. It is helpful to think of it this way - A fruit tree that is 10’ tall by 8’ wide has the same size root area. The soil that is 3’ below the ground level takes a long time to dry out. The takeaway is to WATER DEEPLY AND INFREQUENTLY! Most fruiting and flowering plants that we offer are Certified Virus Free. These plants are produced from virus indexed scion trees and are certified by the Oregon State Department of Agriculture as completely free from known viruses. A Certified Virus Free plant is much healthier and will be more vigorous. 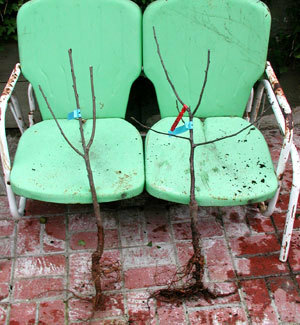 It will grow faster, live longer and will minimize many fruit tree diseases. Because of this you will get better blossoms, and more of them, and the plant will produce larger yields of superior quality fruit. Overall, a Certified Virus Free plant is a lot easier to care for. Some say Kim Elberta Peach requires 600 chill hours, here it is thriving in Fullerton, CA which receives an average of 300 chill hours. Over the last 25 years the number of chill hours (hours of temperature at or below 45 degrees) was a big concern to those who grew deciduous fruit. Within the last year or so (around 2016) this concern has lessened considerably. For the Farmer, it is necessary to a have maximum yield of near perfect fruit appearance for commercial viability. For the Home Orchardist, this is not always the case. A lesser, yet substantial yield of smaller, not perfectly shaped or skin colored fruit is quite acceptable. Especially as the fruit taste and texture is almost always better than store bought fruit. When Fuji Apple was first introduced to the U.S. it's Chill Factor was as high as 700 hours. Now we find excellent quality Fuji Apple Trees bearing bountiful crops with less than 200 hours chill in the Garden Grove area of Southern California. well in that general area. 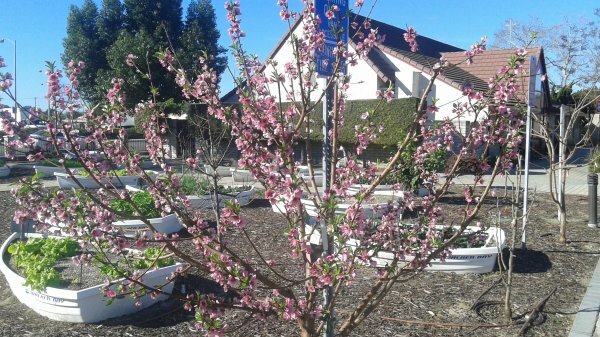 Pollination is extremely important to Fruit Tree Farmers, less so to Home Orchardists. Pollination occurs within the trees flowers, causing the flower to set into fruit. To keep it simple, there are three types of flowers, Complete Flowers (having both male and female parts), Incomplete Flowers (female parts only) and Incomplete Flowers (male parts only). Complete Flowers are often called Perfect Flowers, lncomplete Flowers are often called Imperfect Flowers. 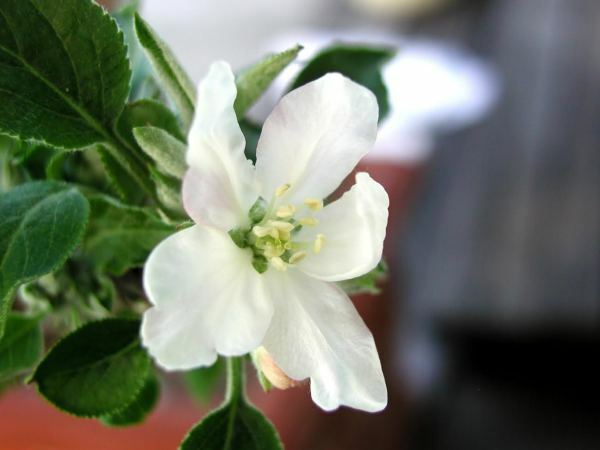 Many fruit trees have Complete Flowers and require no cross pollination. Some fruit trees have both male and female flowers in comparable numbers (on the same tree) and require no cross pollination. Cross Pollination is required for all trees with one type of incomplete flower only. Cross pollination allows a male Flowering Tree and a female Flowering Tree, who flower at comparable times, to set fruit. Many Apples, Pears and Cherries require cross pollination, although some do not. Fuji Apple, d'Anjou Pear and Stella Cherries are self-fertile, so are many other common, very desirable varieties. Most Apricots, Nectarines, Peaches and Plums are self-Fertile. Persimmons, Quinces, Figs, and pomegranates are self-fertile. Walnuts are self-fertile, but most Almonds require cross pollination (All-in-One Almond is a great self-fertile variety). There are other pollinators for the previously listed varieties, these are just examples. Do neighboring areas have fruit trees? Cross pollination can occur from quite a distance. Mild Winter and or cool Summer areas will sometimes cause a tree to produce some Complete Flowers, where otherwise they would produce only Incomplete Flowers. Q: Where can I buy your trees? A: Shoot us an email for a more in depth answer but in general you'll find us at Friedman's Home Improvement, Summerwinds, Home Depot and Lowe's Home Improvement stores on the West Coast. Q: When can I buy your trees? Q: How tall will my fruit tree grow? 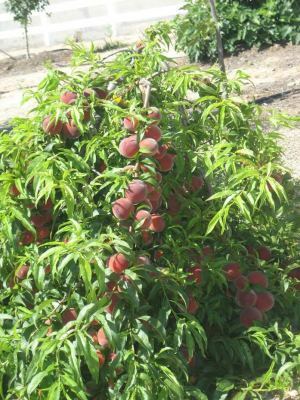 A: Semi Dwarf Fruit Trees (and All in One Almonds) grow approximately 9-12’ tall and about half as wide. Cherries and Pears will be 1/3 as wide. 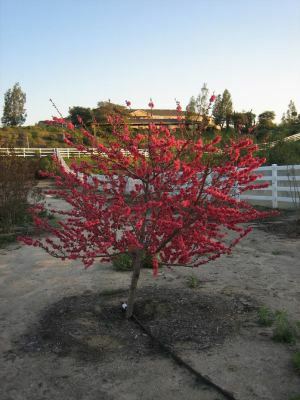 Ultra Dwarf Fruit Trees grow 5-8’ tall and about half as wide. Again, Cherries and Pears will be 1/3 as wide. Ultra Dwarfs will also grow 18”+ in containers. Multi Graft Fruit Trees will grow to approximately 5-7’ tall, width proportion the same as Semis or Ultras. Q: What rootsotcks do you use? A: You can read all about it here . Q: Do you sell the kind of tree I want in a garden center near me? ​A: Contact us via social media or email ! Q: My tree started to flower before I planted it. What should I do? A: It is not too late to follow regular planting practices. Cut the tree back by 1/3 and then plant as normal. Q: My tree didn't sprout, is it dead? 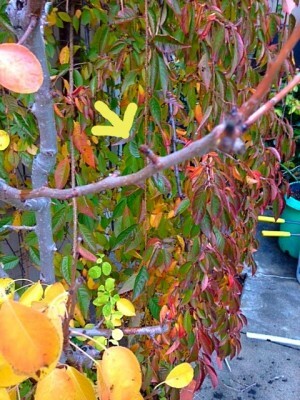 ​A: Scratch away a small amount of the bark on the tree trunk, if it is green underneath then the tree is still alive. Q: I planted my tree this Winter, it's Summer now and I didn't get any flowers or fruit. What's wrong? A: It takes a year, sometimes two, for deciduous fruit trees to fruit. 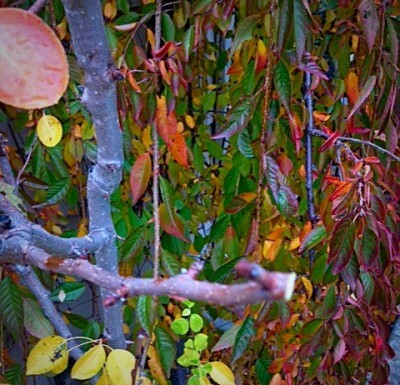 Q: The fruit is dropping off of my trees, what should I do? A: Chances are you're most likely over watering the tree (or over fertilizing) when the fruit is trying to set (going from flower to fruit). Another possibility is a hard frost or some kind of damage got to the tree. Q: I want to transplant my tree. When is the best time to do that?